Note: The spelling "Dragooon" was probably chosen by TAKARA-TOMY to clearly differentiate the Bakuten Shoot Beyblade Dragoon tops and this Zero-G Beyblade. Despite this effort, Hasbro released this Beyblade under the changed name Ronin Dragoon. 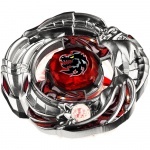 Dark Knight Dragooon is the only left-spin Beyblade in the Zero-G series. With an original release of a blood red Stone Face, the mark on this sticker illustrates the profile view of a Dragon, drawn in a European fashion. Dragooon is currently the only Chrome Wheel capable of left rotation. It can be placed with Chrome Wheels that spin in the opposite direction, but the combo it is in can only spin left if Dragooon is placed on top of the other Chrome Wheel. With three heads, Dragooon strongly resembles most L-Drago Wheels, especially since it's a left-spin Chrome Wheel. Two heads circle almost half of its circumference in a lateral way, while one head is actually flat on top, offering relief slopes upwards only by its lower jaw and teeth. Two webbed wings also cover the rest of the design, with claws encircling the hole where the orb from the Crystal Wheel gets inserted. The sides of the Dragooon Chrome Wheel are therefore composed of the top of one dragon head, the sides of two other heads, the curved structures of the wings' fingers, and the straight ends of the membrane between them. In general, Dragooon consequently has four sections of similar size and shape. It should be noted that there are currently two molds of this Chrome Wheel, which causes a slight difference in the part's weight that is physically visible underneath one of the dragon heads. The mold variation seems to have been distributed exclusively from TAKARA-TOMY, as Dragooons from both Hasbro and Sonokong have been found to be the heavier mold. In one mold, there are two indentations underneath the head, but in the other mold, there are no indentations, leaving the underside of the head completely filled in and therefore heavier. This mold variation does cause a difference of weight of about 1 gram, with lighter Dragooons weighing about 29 grams and heavier ones weighing 30-31 grams. Despite this, the mold variation doesn't affect performance significantly. In the comparison images below, the heavier mold is on the right. When placed on top of almost any other Chrome Wheel, Dragooon can deliver strong attacks, but its protrusions are small compared to other Chrome Wheels and thus it is outclassed in Attack power. However, this Chrome Wheel's capability for left rotation gives it an advantage over other, more powerful right-spin Chrome Wheels because it will not be heavily affected by Zero-G Attacks since it remains unmoved by their attempts to sway the stadium in the opposite direction. Its slight slopes can be used to attack opposing Beys and knock them away when used with low tracks, but this has not proven to be a reliable characteristic. Because of its high weight, it can handle Recoil very well when in Synchrom with rounder, smoother or heavier Chrome Wheels, giving it use in Defense customs. Dragooon has terrible balance, making it bad for Stamina, but its ability to steal spin up to an equal share gives it use in many useful Zombie Stamina combos. Overall, Dragooon has use in Attack, Defense and Stamina customizations and is a part of several top-tier customs for MFB and Zero-G, like MSF-H Genbull Dragooon SA165BWD. Thus, Dragooon is among the most useful top Chrome Wheels in Zero-G. When on the bottom of a right-spin Beyblade in a Synchrom, Dragooon provides weight and small amounts of Smash Attack, but is an unreliable Smash Attack Chrome Wheel because its mediocre contact points are usually blocked by other Chrome Wheels. Also, its numerous but small protrusions are not usually enough to defeat a Defense combo that is heavy or has low Recoil anyway. Because of its lack of balance, other, more balanced Chrome Wheels, such as Killerken, are generally used instead of it. However, when on the bottom of a right-spin Synchrom, Dragooon's slopes face downward and can force opponents downward, destabilizing them, but this is not a reliable trait and causes Dragooon to lose Stamina in the process. Thus, Dragooon should not be chosen as a lower Chrome Wheel unless there are not any better options like Killerken, Genbull, Gryph, or Revizer. When Dragooon is doubled to make a Synchrom, the combination becomes much heavier, and since it has a similar shape on both sides, its contact points are exposed well and it retains its Smash Attack ability. That being said, it also exposes much more aggressive contact points that are present on the back of the dragon heads. This allows for stronger Smash Attacks, but much higher Recoil as well. While this can sometimes be effective, the Recoil often proves too much for Dragooon to handle. Thus, there are better Chrome Wheels to be used with Dragooon with the latter on top, such as Killerken, Gargole, Revizer, and Wyvang, but Dragooon can still be used in Synchrom with another Dragooon to make a heavy, balanced combo. The Dragooon Chrome Wheel is an essential part of the top-tier custom ______ Dragooon F230CF/GCF. Dragooon's spin-equalizing capability combined with CF/GCF being some of the best parts for Zero-G Attacks and the stamina that F230 provides makes this combo one of the few that can consistently defeat almost every type of Beyblade. The wide disk around CF and GCF allows the combination to rest upright when its main stamina has died down, which in turn allows the upper section of F230 to keep rotatingindependently when both Beyblades have stopped sharing spin. It can Spin-Equalize to often outspin Zero-G Attackers or Stamina types that are hard to KO, and it is heavy and powerful enough to be able to KO Defense and Stamina types in the Zero-G Stadium and to defend against Attacks from a Smash Attacker. In order to be the most effective, though, the right launching technique must be used with this combo, such as Weak Shooting against Zero-G Attackers or Stamina-Defense or pure Defense combos, and launching hard against Smash Attackers. It should be noted that there are currently three molds of F230, an orange one from Bandid Genbull F230TB, a brown one from Thief Saramanda F230SF, and a red one released by Hasbro as part of the Golem Behemoth Earth Synchrome 2-Pack. The mold used can heavily effect this custom's performance, and the original orange one has proven to be far superior to the others in performance with this combo. Dragooon is useful in the Zero-G Balance custom Dragooon/Phoenic/Ifraid/Gargole Dragooon LW160/SP230/E230/SA165CF/GCF/GF. Dragooon's compensated(ing) balance when in Synchrom paired with the left-spinning Stamina that LW160 provides allow this combo to outspin opponents it cannot KO by Zero-G Attack, the Attack Bottoms also helping due to their lack of rubber. Because of its considerable weight and capability for left rotation, Dragooon can be effectively used to defeat right-spinning Beyblades in the powerful Zero-G Defense custom MSF/MSF-H Gargole/Killerken/Revizer Dragooon BGrin. BGrin's strong resistance to Zero-G Attacks combined with the weight and spin equalization that Dragooon provides makes it a very difficult combo to defeat, staying in place despite the swaying movement attempted by the Zero-G attack customizations. Dragooon's heavy weight and its ability to spin left also makes it useful in the customizations MSF/MSF-H Dragooon/Gargole/Killerken/Revizer Dragooon SA165EWD, which utilizes Dragooon's Spin Stealing abilities with SA165's increased weight distribution, round shape that helps it to roll after toppling, and EWD's high amounts of Precession. The combo ______ Dragooon F230CF/GCF has also shown to be very useful in BB-10 Stadium because of its ability to KO Defense and Stamina types, and its ability to outspin Attack types and Stamina types due to its Spin-Equalizing capability. Dragooon is an essential part of the customization MSF-M Bahamdia Dragooon BD145R²F. This Attack combination in the BB-10 BeyStadium Attack Type has proven to have amazing Smash Attack. While few combos can knock out F230CF/GCF customizations, this Bahamdia Dragooon Synchrom can achieve this as well as defeat BD145- and E230-based Defense types easily. Dragooon is an essential part of the useful customization Wyvang Dragooon SA165(Zero-G Attack Mode)R²F/LRF/RF. This combo is able to outspin many Stamina and Defense due to Dragooon's ability to spin-equalize and R²F's ability to Tornado Stall and can also knock out Beyblades with Defense Tracks like E230 and BD145 due to Wyvang's excellent Smash Attack capability. Dragooon can be used in the custom MSF/MSF-H Killerken Dragooon DF105LRF. 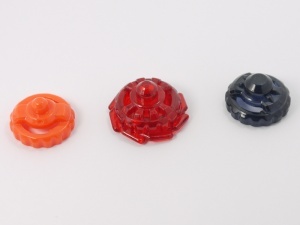 Its low center of gravity, weight and attack power allow it to KO and outspin other Beyblades. Dragooon is a part of the top-tier Balance custom MSF/MSF-H Wyvang Dragooon BD145RDF. It has strong Defense because of its weight, can outspin other Beyblades through Spin Equalization and can KO combos because of its Smash Attack if launched aggressively. MSF/MSF-H Gargole/Killerken/Revizer Dragooon SA165EWD/W²D is also very useful in the BeyStadium Attack Type because it utilizes Dragooon's Spin Stealing abilities with SA165's high Life After Death abilities and EWD's high amounts of Precession. Dark Knight is composed mostly of sharp studs on one half of the Crystal Wheel, with the other half depicting a aggressively curved blade. A slight, smooth slope is created by this blade in Dark Knight's design. Dark Knight is clear white in color. Like Dragooon, Dark Knight can be fit on any other Chrome Wheel, even right-spinning ones. It must be placed in Crystal Up Mode, however, to make the customization it is a part of spin left. When paired with Dragooon and other Chrome Wheels, Dark Knight can provide some Smash Attack, but like all other Crystal Wheels it is rendered useless because of its light weight, compared to Synchroms. The LW160 Track is in most aspects entirely identical to W145, however the wings face the left, and its height is different. This height difference makes the wings on the track much more susceptible to attacks from a shorter Beyblade, which will usually severely destabilize the Beyblade using LW160 and can sometimes damage the Track. This part's counterpart, 160, albeit not having as much Stamina as LW160 in left spin, does not suffer from the same destabilization problems. Thus, because of the fact that the strong phenomenon produced by the wings is mostly neutralized in left spin due to destabilization, this Track only helps when used on a left-spinning combination in battle against a Beyblade with a taller Track. However, LW160 can serve as a replacement for customs that normally use 160, such as Duo Cygnus 160PD, a Stamina type combo. While its tip is simply a slightly wider Semi Flat, it is mounted on an imposing base with a linear row of 8 blades facing left circling its circumference, as well as eight ridges below them that surround the tip. The blades are shaped similarly to LW160's wings, however they are less spaced. This tip should not be used on Attack customs because of its lack of speed and mobility. While at first the blades seemingly help produce a downward force effect, they are too small to make any difference in Stamina. These blades never touch the Stadium floor. Instead, the lower eight ridges do, and while they do help the Beyblade regain balance, the effect they produce is negligible. In Zero-G Stadiums, combinations using BSF are extremely difficult to KO by Zero-G Attack and the tip has the ability to wobble for extended periods of time and sometimes regain its balance, allowing it to outspin opponents. When in left rotation, it is even harder to sway out of the stadium. It also can be used in semi-aggressive Balance customs as well as wobbling Stamina combinations for the traditional stadiums. Overall, BSF is a very useful bottom for both the Zero-G and regular BeyStadiums. BSF finds great use in the Zero-G Defense custom MSF-H Revizer Revizer E230BSF. Its semi-aggressive movements allow it to evade the effects of Zero-G Attacks. BSF also does well in the BeyStadium Attack Type, in the Balance combo MSF-H Gryph Gryph E230BSF. This custom utilizes Gryph's Force Smash abilities with E230's pinch KO capabilities and BSF's capacity to wobble at extreme angles to make a powerful Balance customization. While Dark Knight and LW160 do not provide much use, Dark Knight Dragooon does contain two very useful parts, Dragooon and BSF. While it is best as a Spin Equalizing Chrome Wheel, Dragooon's heavy weight and capability for left rotation make it one of, if not the best, Chrome Wheels in Zero-G. Its amazing versatility and the fact it can be used in all categories of customization make it a very reliable competitive part. Also, BSF is a very good Bottom for resisting Zero-G Attacks in a Zero-G Stadium and for Balance customizations in the BeyStadium Attack Type. 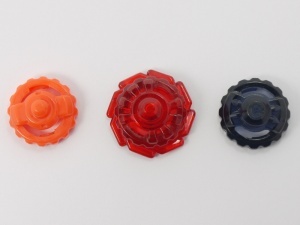 Therefore, this Beyblade is a must-have for all Bladers, and an excellent addition to any collection. This page was last modified on 4 October 2014, at 18:31. This page has been accessed 102,727 times.